The recent user survey highlighted the fact that not everyone is aware of some of Brickset's advanced features. In attempt to remedy this I will be writing a series of tutorials which will each explain a particular feature or how to accomplish a particular task. Over time they will form a useful reference in the news archive. To start with I will explain how to customise which articles appear on the home page and how you can hide those you don't want to read. For this to work you need to be logged in. If you are not logged in already, log in, or if you do not have an account, sign up now for one. The first thing to do is to view your user profile. It is accessible from every page by clicking on your name at the top right of the page. From here you can manage your profile and user account and also set preferences. 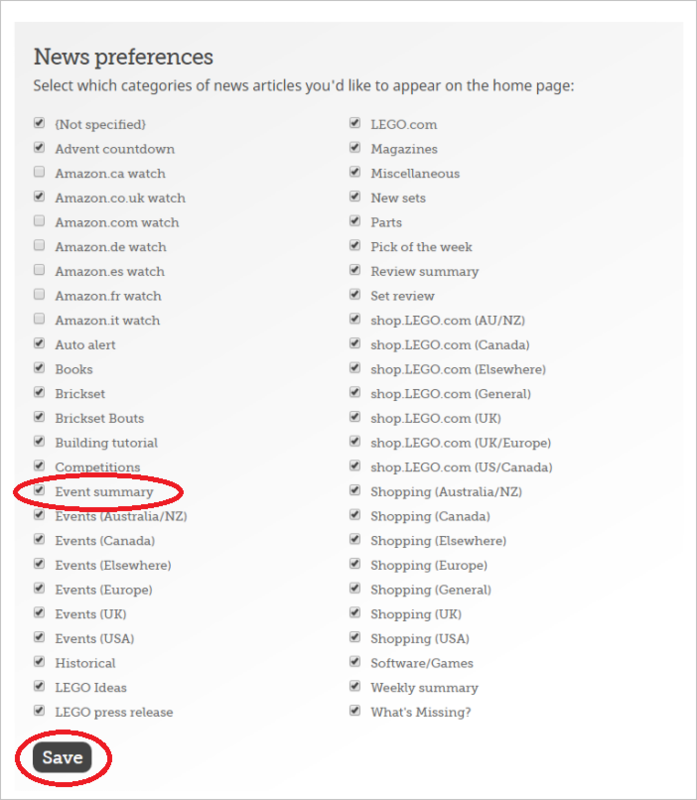 Click on News category preferences in the menu. The screen will now show all categories we use to classify our news articles. By default they are all checked except for the Amazon ones that are not relevant for your country. Simply un-check the categories you have no interest in and press Save. For example, if you do not want to see the event summaries we publish every Sunday, un-check the box next to it and press Save. Now, go back to the home page and see the effect of your changes. Next week I will look at BrickLists: what they are, what they are useful for and how to create and share them. What is the Auto alert for? And what are Brickset Bouts? It would be nice if these preferences were integrated with the Theme Preferences: if a news item is about a theme we don't care for, it wouldn't show up. Nice idea, but at the moment we don't tag news articles by theme. You can view previous articles in specific categories in the news archive. The Auto alert category is currently not used. We haven't published any Brickset Bouts yet. Thanks! Can't upvote / "+" / reward / thank enough! Much clearer now. Awesome! Huw, the most surprising is to see the numbers of your collection … wow!! I just recently did this a couple of days ago! :D It's a very useful feature. Thank you Huw, this is VERY helpful and I am looking forward to your other articles. Great tutorial, thank you! Been looking for a way to hide a few categories. Second that request to have this apply on RSS feeds too! This is great. It might be a good idea to link to this article at the end of every Huwbot post, so you don't get newcomers asking the same question on every survey.